Walking around town with bigger arms and a thinner stomach can help boost your self-confidence levels. Another benefit is that any time you lose stomach fat, you also reduce your risk for chronic diseases. Losing weight in one area, while gaining it in another is challenging, but not impossible. The best way to go about it is by making adjustments to your diet and following good training tactics. Any time weight loss is a goal, your caloric intake needs to be taken into consideration. Because you want to achieve a flatter stomach while bulking your arms, cut back by only a moderate amount. A 250-calorie daily reduction is sufficient. Find your starting intake by tracking your calories for a week, adding the totals and dividing by seven. Make sure to base your diet on healthy fare, such as lean meats, whole grains, fruits, vegetables and low-fat dairy products. Spot reduction is the concept that you can lose weight in one area by doing a dedicated exercise for that area on a regular basis. When it comes to the stomach for example, people often think they can shed fat by doing crunches and situps. Do not be fooled by this myth. The only way to shed stomach fat is by losing overall body weight. A good way to do this is by performing cardiovascular exercise such as running, biking or elliptical training. Keep in mind that you want to build big arms. Do not spend long hours doing cardio. Three training sessions a week performed for 45 minutes at a moderate intensity should suffice. The arms contain two large muscles on the front and back sides. 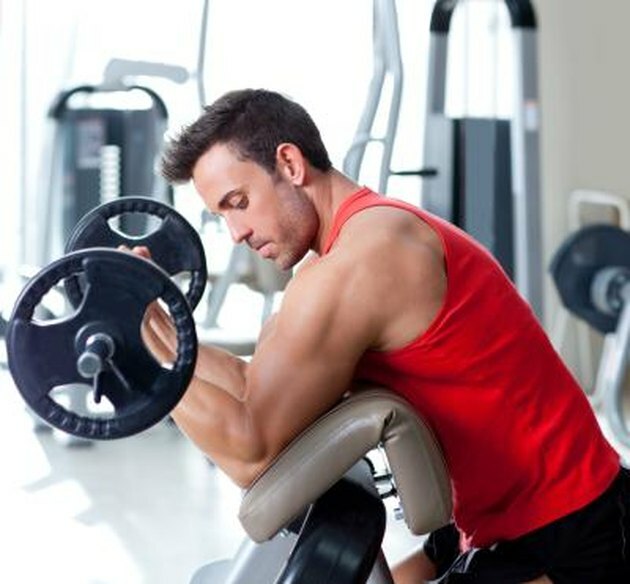 The biceps sit on the front and the triceps run down the back. Your objective is to target both of these muscles with exercises. 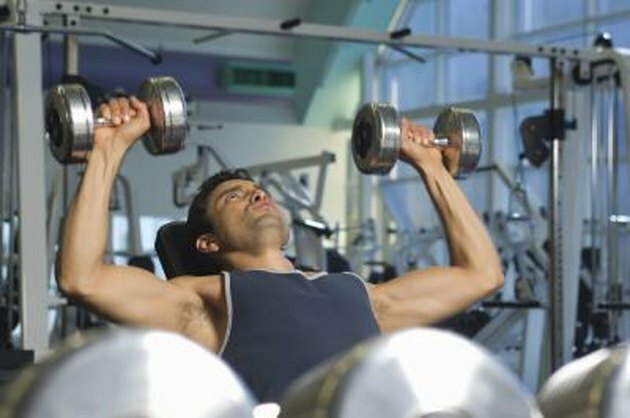 Perform exercises such as close-grip bench presses, dips, overhead triceps extensions, barbell curls and twist curls. Free weights and machines both build strength. However, free weights lead to more overall muscle-fiber recruitment, which can boost your progress. Use barbells and dumbbells with all of your exercises and use a heavy resistance. Aim for a weight that you can lift only eight to 12 times. If you need assistance, have a spotter on hand. Strict form is critically important for developing bigger arms. If you do not move through a full range of motion, your muscles will not get fully taxed and you will compromise your gains. For example, for close-grip bench presses, lie face-up on a flat bench and hold a barbell straight above your chest with your hands about 10 inches apart. Your arms should be fully extended at this point and your palms should be facing forward. Slowly lower the bar by bending your elbows and stop when it is right above your chest. Steadily push the bar back up and repeat. When lowering the bar, keep your arms tight to your sides. Ab exercises do not have to be avoided altogether. They will help you tighten and tone your stomach as you lose weight. Perform exercises that target all areas of the waist such as hanging knee raises, reverse crunches, Russian twists and tabletop crunches. 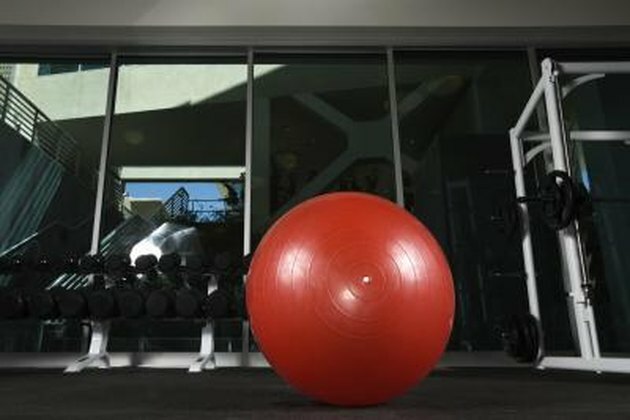 When doing your arm exercises, perform as many as possible while sitting or lying on a stability ball. This will cause you to work your abs by default and further promote a tighter stomach. Can a Flabby Stomach Be Toned Up?